AGURA (胡座 or 胡坐 Barbarian Sitting) Agura is the name for an informal cross legged sitting position. Traditional etiquette dictated that sitting in the Agura position was both brutish and unrefined, and as such was generally avoided. ATEMI WAZA (当身業 Methods of Striking People) The term Atemi Waza is a general phrase used to describe all strikes made with the hands, elbows, forearms, knees, legs, feet and even the forehead. CHIKUSAJI (Police Officer) The Chikusaji was an Okinawan feudal rank similar to that of a police officer. 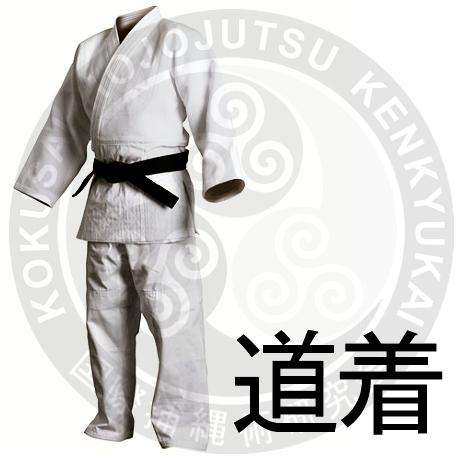 DOGI (道着 Clothing for the Way) The term Dogi is used to describe the clothing / uniform worn specifically for martial arts training. Dogi is another term for the more descriptive Keikogi. DOJO (道場 Place of the Way) The term Dojo is used to describe a martial arts training hall. FUNDONAWA (分銅縄 Weighted Rope) The Fundonawa is a length of rope with a metal weight attached to one or both ends not dissimilar to the Chinese weapon known as a ‘Liúxīng Chuí’ (Meteor Hammer). GANJIGARAME (雁字搦め To Bind Like a Wild Gouse / Bound Hand and Foot) the term Ganjigarame is in its non-literal translation used to describe the act of immobilising someone through bindings or fetters. HAKAMA (袴 Culottes) The Hakama are a pair of floor length, deeply pleated culottes worn as part of a mans formal attire. 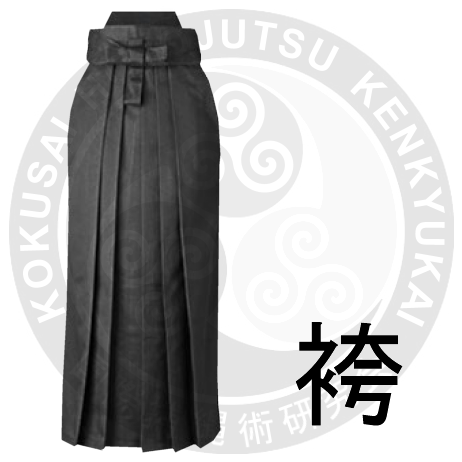 Within many modernised martial arts Hakama are often considered a mark of the Yudansha. The Hakama themselves evolved from the heavy Chaps worn by early mounted warriors, and were retained as the mark of the warrior caste long after the Bushi began to predominantly fight on foot. HAYANAWA (早縄 or 早繩 Fast Rope) The term Hayanawa translates as ‘Fast Rope’ and are generally simple, quick ties performed with a short, thin length or rope not normally more than two metres in length. HEBIGUCHI (蛇口 Snakes Mouth) A small loop worked into one end of a length of rope, also called a Jakuguchi. HEBIZEME (蛇責め Snake Torture) Hebizeme is a form of torture where a bound individual is placed in a large tub or pit filled with venomous snakes. HIBUKI (秘武器 Hidden Weaponry) An alternative name for the Kakushibuki classification of weaponry. HISHINAWA (菱縄 Diamond Rope) Within the art of Hojojutsu, the term Hishinawa is used to describe a huge variety of bindings that predominantly feature, or are built around one or more Diamond patterns. HONNAWA (本縄 Main Rope / Head Rope / Chief Rope) The term Honnawa translates as ‘Main Rope / Head Rope / Chief Rope’ and is designed to be far more secure that the rapid ties of the Hayanawa; using much more complicated binding patterns as well as a longer length of thicker rope. These ropes are often in excess of five metres in length. ICHIMONJI (一文字 Straight Line Shaped) Within the art of Hojojutsu, the term Ichimonji is used to describe a number of bindings that are in essence a single straight line. ISHIDAKI (石抱き Stone Embrace) A method of Torture combining Hojojutsu with the stacking of large stone slabs upon the victims kneeling lap. Frequently the victim was made to kneel on triangular wedges of wood, during their ordeal, which only served to intensify the pain more whilst the stone weights crushing bone and muscle. JUMONJI (十文字 Crucifix Shaped) Within the art of Hojojutsu, the term Jumonji is used to describe numerous bindings that share an overall cruciform design. JUTTE (十手 Ten Hands / Ten in the Hand) The Jutte is a metal or wooden truncheon, normally with a single forward facing metal prong attached at the point where the handle meets the shaft. (It should be noted that some forms of Jutte feature two or more prongs, and it would seem that the design of these was largely down to personal choice) Jutte were formerly carried as a badge of office by the feudal police, the Jutte can be used to block, deflect or disable an armed attacker without serious injury. JAKUGUCHI (??? Mouth) A small loop worked into one end of a length of rope, also called a Hebiguchi. JITTE (十手 Ten Hands / Ten in the Hand) The term Jitte is an alternative reading of the word Jutte. JUTTEJUTSU (十手術 Ten Hands Art / Ten in the Hand Art) Juttejutsu is the art of using a Jutte in a combative situation. KAGINAWA (鉤縄 Hooked Rope / Grappling Rope) A length of rope with a hook attached to one end. 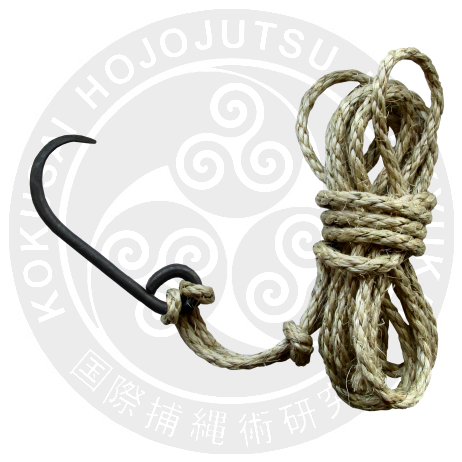 When used In Hojojutsu, a Kaginawa hook could be inserted into a piece of clothing or even the opponents topknot in order to improve binding and control. Somewhat confusingly the term Kaginawa 鉤縄 does not differentiate between the Kaginawa used in Hojojutsu, and the Grappling Hook style Kaginawa. KAKUSHI (角指 Spiked Rings) The Kakushi are small metal rings with one or more spiked points on it’s outer edge. These spiked rings are used in conjunction with various grappling arts to ‘encourage’ an opponent to be compliant. KAKUSHI BUKI (隠し武器 Hidden Weapons) Kakushi Buki is the general term used to describe a wide variety of hidden weapons, including those that can be concealed within the palm of the hand such as Kakushi Rings and Tenouchi. KAKUTE (角手 Horned Hand) An alternative name for the kakushi style of spiked rings. KANAWA (仮縄 Temporary Rope / Interim Rope) An alternative name for Hayanawa, not to be confused with the term Kannawa. KANNAWA (鐶縄 Metal Ring & Rope) The Kannawa is a length or rope with a single metal ring affixed to one end; the other end or even a central portion of rope can be passed through this ring to make a very fast slip and loop. The disadvantage of the Kannawa is that unless it remains under continual tension, the rope becomes very loose. Not to be confused with the term Kanawa. KANSETSU WAZA (関節業 Joint Locking Methods) The term Kansetsu-Waza is an umbrella term to describe the myriad of locking techniques performed on the joints of an opponent. KATA (形 Form / Shape) The term kata is used to describe the Prearranged techniques and drills used to pass on essential principles within Japanese martial arts. Kata can be broken into two types, kata performed alone (Tandoku Renshu) and Kata performed in pairs (Sotai Renshu). KATAIMUSUBIME (固い結び目 A Tight Knot) (Source: Everyday Japanese Vocabulary). KEIKO (稽古 Training / Practice) The act of practicing a martial art, either formally within a Dojo, or informally outside of one. KEIKOKAI (稽古会 Training Group / Association) A group of people working together in a formal Keiko. KIHON (基本 Fundamental Teachings) Kihon is a term used to describe the basic techniques that form the essential foundation for all other methods. KINUNAWA (絹縄 Silk Rope) A rope made from silk. According to some traditional sources silk ropes were used for Hojojutsu training within the Dojo, as it did not tangle easily and could be quickly removed; although this made it's use in combative Hojojutsu impractical at best. KIRINAWA (切り縄 Cut Rope) A length of rope cut to a particular size for whatever its intended purpose. 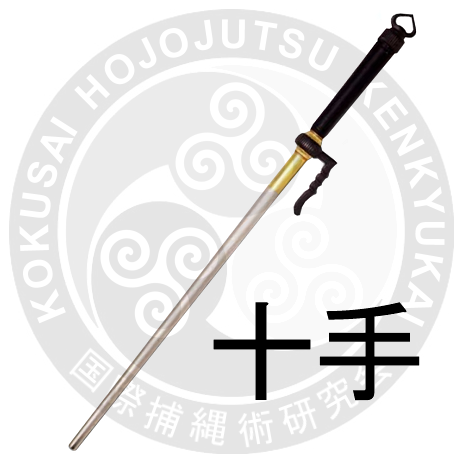 KOBUKI (小武器 Small Weapons) A term used to describe any small or generally non-lethal weapons including Kakute, Jutte and Tessen. NAGE WAZA (投業 Throwing Techniques) The phrase Nage Waza is a general term used to collectively describe all forms of throws, trips and projections within the martial arts. OBIJIME (帯締 Sash Cord) The obijime is a decorative cord worn over the decorative sash on a ladies kimono. An illustration by the artist Kuniyoshi entitled ‘Uramatsu Handayu no Tsuma – The Wife of Uh’ clearly depicts a female from a samurai family employing her Obijime as a makeshift Hayanawa in order to restrain a burglar. PARASHUTO KOODO (パラシュートコード Parachute Cord / Paracord) Within modern rope arts the use of Paracord has become increasingly popular, however it's very thin diameter can make its use exceptionally dangerous for inexperienced practitioners. REIGI (礼儀 Correct Etiquette) The term Reigi is used to describe the collective practice of good manners within any dojo environment. It includes numerous methods of bowing, sitting and speaking. RUIKEI NO JUTSU (縲繋之術 Tying & Binding Art) An alternative name for the art of Hojojutsu. SAGEO (下緒 Sword Attachment Cord) A length of flat braided cord used to securely attach the Saya portion of a Katana to the Himo of the Hakama. SATORI (悟り Comprehension / Enlightenment) Originally a Buddhist meditative term, the word satori has come to describe an epiphany or moment of sudden realisation. SEIZA (正座 Correct Sitting) The term seiza is used to describe the formal sitting / kneeling method synonymous with Japanese etiquette. It is characterised by its kneeling position with the tops of the feet flat to the floor, and the buttocks resting up on the soles. SHIME WAZA (締業 Strangulation Techniques) The term Shime Waza is used to describe a varied number of choking and strangulation techniques. TENOUCHI-NAWA (手の内縄 Grip Rope / Within the Hand Rope) The Tenouchi-Nawa is a length of rope attached to which is a short metal bar. This combination of rope and bar allows the user a greater degree of grip and leverage on the rope than would normally be allowed. The length of the rope portion varies between examples, but a Hayanawa type length would appear to be more common. TENUKIHIMO (手貫紐 Jutte Tassel / Hand Bracing Cord) A Tenukihomo is the braided cord or thin rope attached to the handle portion of a Jutte, and used as an aid to making an arrest. In appearance the thickness and colour of Tenukihimo vary widely, with some ending in a simple knot, large decorative tassel or even a small metal ring. TOGIJUTSU (伽術 Attending Rope) An alternative name for the art of Hojojutsu. TORIMONO (捕り者 Capture Person) During the Feudal period the term Torimono could be applied to any individual specially trained in the art of Hojojutsu and working for the Shogun or a local Daimyo in the field of law enforcement. These individuals were frequently of Doshin status, but rarely of Samurai rank. TORINAWA (捕縄 Restraining Rope / Capturing Rope) The term Torinawa can be applied either as the alternative kanji reading of Hojo 捕縄 but is more commonly used to describe a rope used within the art of Hojojutsu. TORITE (捕り手 / 捕手 Capturing Hand) Torite is the art of overcoming and restraining an opponent with one's bare hands, or a small non-letal weapon such as a Jutte or Hayanawa. UFUCHIKU (Police Chief) The Ufuchiku was an Okinawan feudal rank similar to that of a police chief. ZUKAI HOJOJUTSU (図解捕縄術 The Illustrated Rope Restraint Art) The Zukai Hojojutsu is perhaps the most comprehensive guide to the history and techniques of Hojojutsu as compiled by its author Fujita Seiko and published in the autumn of 1964.